Displaying a diploma in a frame signifies an academic achievement. The diploma frame on the left is a custom framed University of Georgia diploma. We frame a diverse collection of university diplomas for our military customers. Quite simply, we see diplomas from across the United States brought to us for framing. 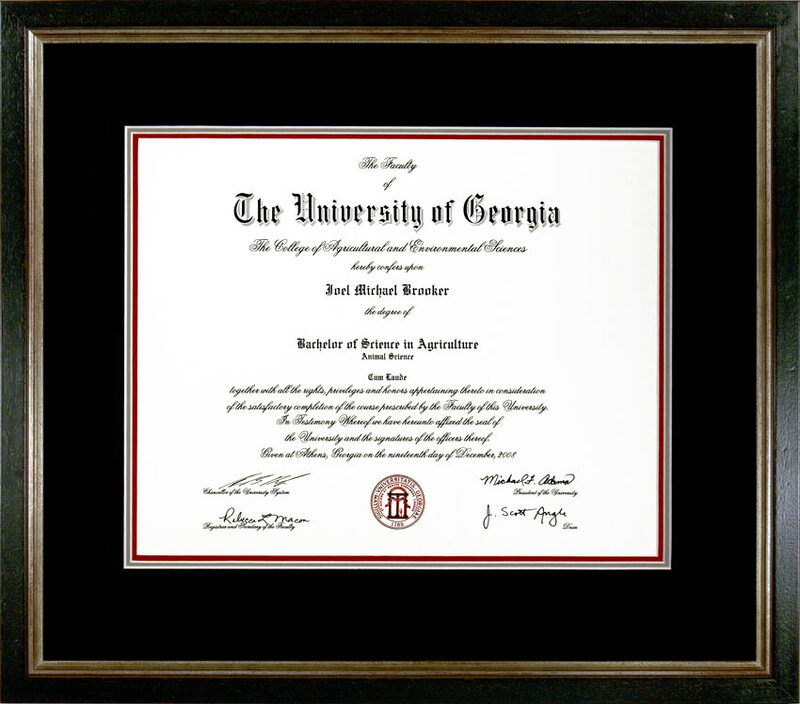 Closer to home, framing UGA diplomas offers us the ability to produce unique diploma frame designs for UGA customers. 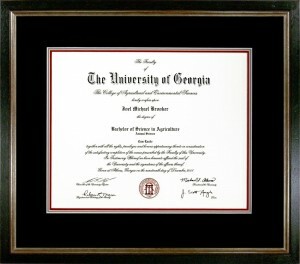 This University of Georgia example illustrates that custom framing diplomas can accomplish a design that goes beyond the standard black or mahogany frame, with black and white mats in a cookie-cutter design. The UGA example for this diploma uses a distressed wood frame with a rich black finish and a distressed silver inner edge with red highlights. The diploma is framed using triple acid-free/conservation grade mats and 99% UV protective Glass. The color scheme incorporates the University of Georgia’s colors–red and black. It also incorporates a gray mat in the middle that reminds us of the UGA silver britches—the football team’s pants. University of Georgia diplomas can be framed in a number of ways—including coins, tassels, and insignias. Need ideas for diploma framing? Contact us and we will be glad to assist you. Graduation from the U.S. Army Ranger School is a great achievement that reflects an individual’s exemplary physical and mental discipline. It is also a source of great pride for Ranger School graduates. Many Ranger School graduates commemorate this event by framing their Ranger School diploma. 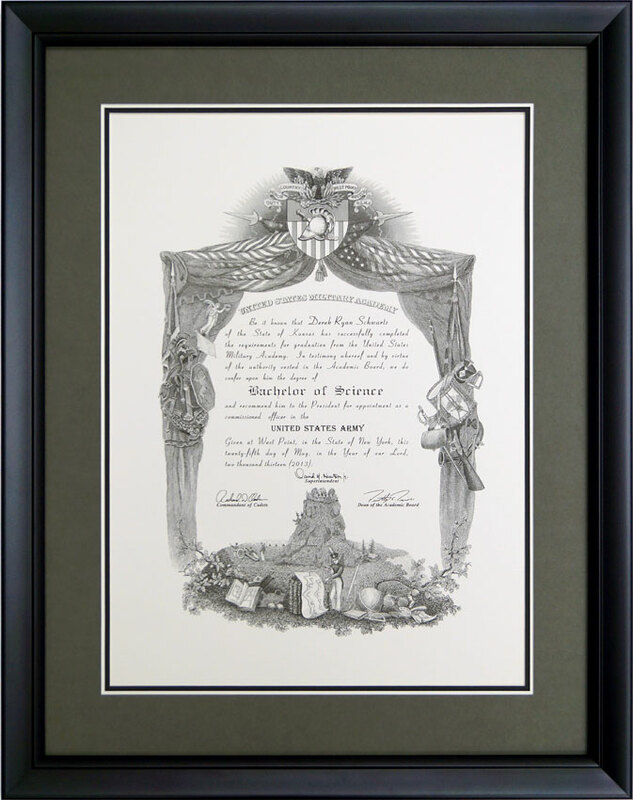 We have custom framed Ranger School diplomas in a number of ways for our customers. 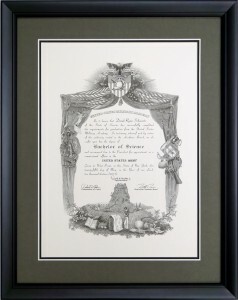 Some Ranger School diplomas are framed simply using the diploma in a design with mats and a simple frame. This example incorporates additional elements in a more elaborate design. In addition to the diploma, a graduation class photo and a Ranger tab are included in the frame. This diploma was framed using triple acid-free/conservation grade mats. The top and bottom mats are etched black. The middle yellow mat matches the Ranger colors. An open V-groove surrounds the diploma, photograph, and Ranger tab. The open V-groove adds depth and symmetry to the design and provides a good contrast of colors. A black finish wood frame also provides contrast against the Ranger colors. 99% UV protective glass covers the mats and the objects inside the frame. Ranger School diplomas can be framed by incorporating patches, rank pins, badges, tabs, medals, ribbons, and photographs into the design. Need Ranger School diploma framing ideas? Let us help. We will gladly design a Ranger School diploma frame that uniquely reflects the graduate’s military career. Why Custom Frame Awards, Certificates, and Diplomas? On the right is an example of a custom framed U.S. Army promotion certificate. A good reason to custom frame military awards and certificates is because they provide a proud display of military achievements. 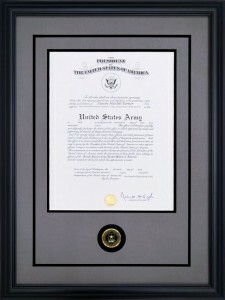 Custom framed promotion certificates also provide a sense of honor and duty. Framed certificates and awards speak volumes about the character and discipline of the person for whom they were framed. This example is custom framed using a black wood profile and double acid-free/conservation grade black and gray mats. The mats have a reverse bevel cut. An Army coin is centered beneath the promotion certificate. An open V-groove surrounds the promotion certificate and the coin. The open V-groove adds balance and provides color contrast to the frame design. 99% UV protective glass covers the mats and the document. We offer the customization of certificate frames to reflect an individual’s career. The inclusion of coins, rank pins, medals, ribbons, and photographs are just some of the items we can place with the promotion certificate in a custom frame design. At the pinnacle of academic military training are the U.S. military academies. Graduation from any of America’s military academies is an honorable and noteworthy achievement. This accomplishment should be recognized by properly custom framing a military academy diploma using conservation grade framing techniques and materials. On the left is an example of a custom framed West Point diploma with a gray top mat. The West Point diploma was framed using acid-free/conservation grade triple mats. A gray top mat, off-white second mat, and a black bottom mat were used in the color coordination scheme that matches the black, gray, and off- white diploma. A traditional style wood black frame complements the black and gray theme for this custom West Point diploma frame. 99% UV protective glass covers the West Point diploma and the mats. Conservation grade framing materials and techniques were used to create this frame. This ensures that this heirloom will be passed down to future generations for viewing. 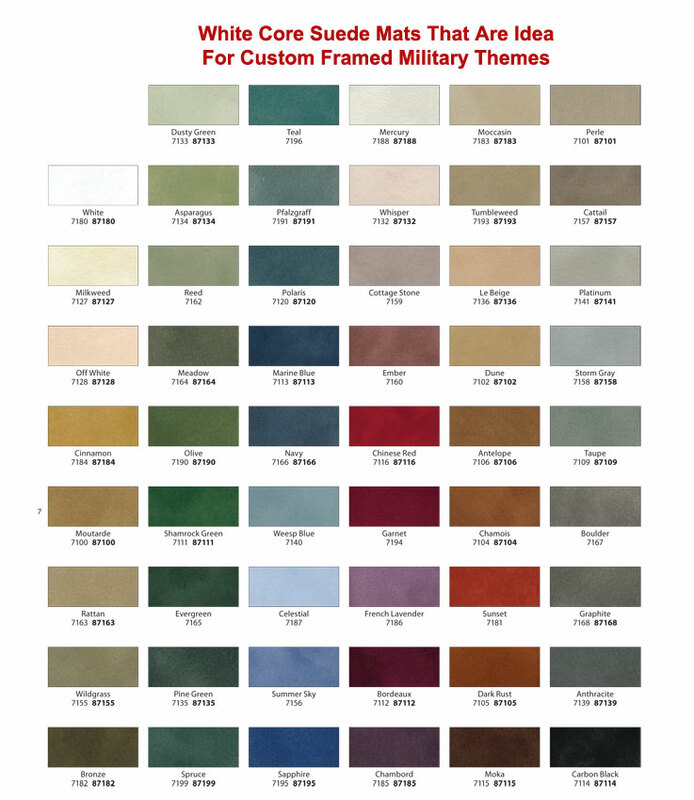 We offer a number of variations in mat colors and frames for creating military academy diploma frames. Our designs are also able to incorporate mementos or photographs beneath the diploma. Please contact us with any questions you may have regarding diploma frames for a military academy. We will be more than happy to make suggestions and create designs for your diploma. Often, graduation from a college or a university is the first step towards a rewarding career. However, graduation from traditional colleges or universities is not the only education people pursue in order to better themselves to achieve a higher rank within a company or an organization. Military academies turn out graduates every year. And within the military, further training by enlisted personnel, noncommissioned officers, and officers is prevalent and a requirement for specialized jobs. Upon completion, they receive either a diploma or a certificate. An example of this is the framed Ranger School diploma example above and to the left. Graduation from specialized military courses and schools propels the graduates toward higher rank with career advances. Throughout a military career, recognition is bestowed on individuals with diplomas, certificates, and awards. Some of these diplomas, certificates, and awards represent significant achievements. Some of these schools require not only educational discipline, but require mental and physical discipline as a prerequisite to completing the course or training. We believe success and achievement should be recognized by awards, certificates, and diplomas. We further believe they should be properly custom framed and displayed. Custom framing offers a visual reinforcement for the time and effort necessary to achieve the successful completion of an educational or physical pursuit. A good example of recognizing a soldier’s achievement is a custom framed award, such as The Order Of Saint Maurice. The Order Of Saint Maurice recognizes an infantryman for demonstrating a significant contribution supporting the infantry. The recipient of this award is acknowledged for having demonstrated the highest standards of integrity, moral character, professional competence, and dedication to duty. The award of Legionnaire’s rank further identifies the candidate as having made a conspicuous contribution to the infantry. 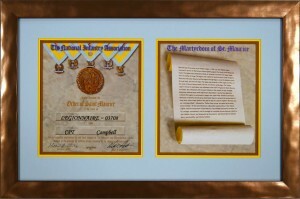 This example demonstrates the opportunity to custom frame a special award for an infantryman. 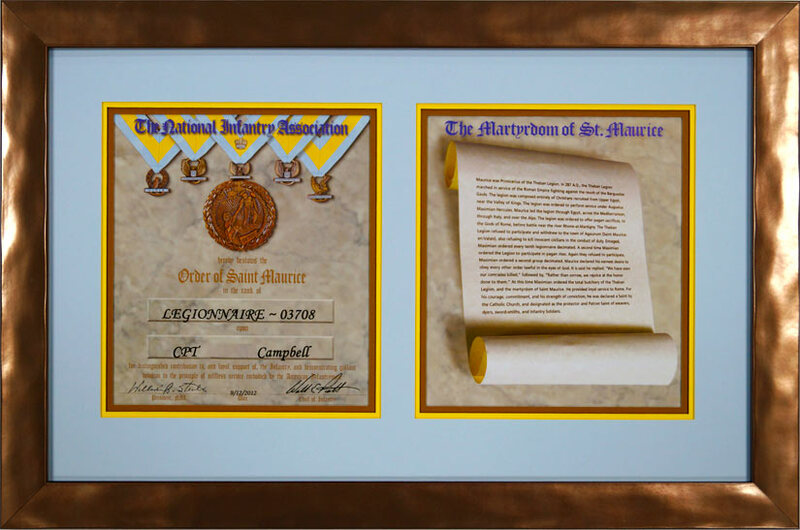 Custom framing The Order Of Saint Maurice also demonstrates that awards framed with designs other than black frames with black and white mats can offer exceptional appeal. The award is triple matted with acid-free/conservation grade mats and 99% UV protective glass. A brushed bronze-tone frame matches the medallion in the certificate. This design uses conservation grade framing materials and techniques to preserve this award as an heirloom for future generations. Variations of this design are available that may include rank pins, infantry insignia, and unit patches. At the very least, a college diploma should be framed and displayed. It is a simple matter to have a college diploma framed at a big box frame store. For that matter, a college diploma frame can be purchased from the major business supply stores or online from a cookie-cutter diploma frame factory. Naturally, this will be your cheapest option. Unfortunately, the cheapest option will not stand the test of time with respect to quality or the possibility of damaging your diploma, award, or certificate. 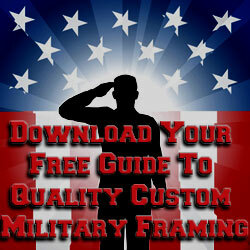 We address this issue in great detail in our page titled, “Guide To Quality Custom Military Framing”. In that section, we explain the necessity for selecting a quality custom framer that practices conservation/archival framing. For example, we explain that using a heat press to dry-mount a sheepskin diploma will damage or destroy it. Our prices for custom framing awards, certificates, and diplomas are reasonable when balanced against the possibility of permanently damaging your diploma by a discount framer. We address the issue Price vs Quality on our Pricing Policy Page. 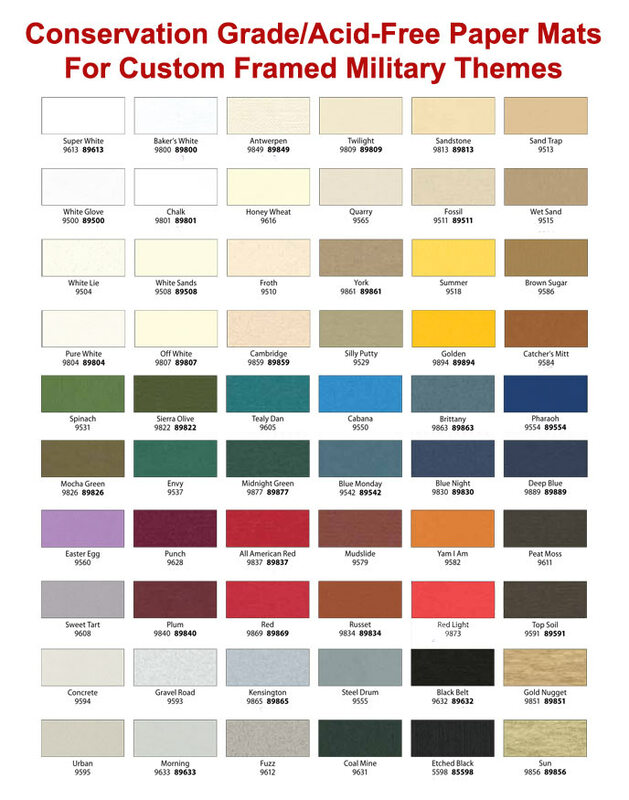 When we custom frame awards, certificates, and diplomas we work with a wide selection of picture frame profiles and mats that include paper acid-free/conservation grade paper mats, acid-free/conservation grade suede mats, and acid-free/conservation grade linen mats. 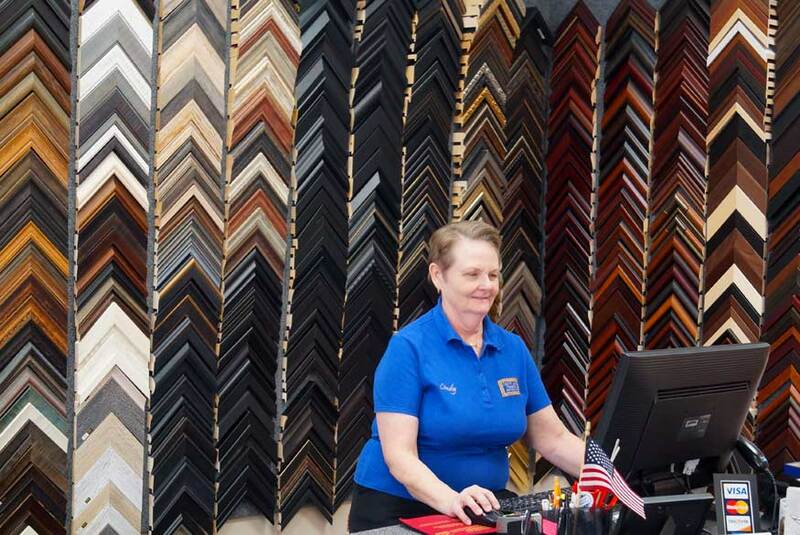 The wide latitude of our framing material selections enables us to offer unique diploma frames, certificate frames, and awards frames. Also, because we are custom picture framers, we can suggest incorporating design elements with a diploma, certificate, or award that will greatly enhance the visual appeal of the items framed. Many colleges and universities offer coins and insignias. The military issues challenge coins. Coins from both civilian and military sources make excellent additions to a design for college diplomas, school certificates, or awards that praise an achievement. Mat combinations can also be configured to create a frame that includes tassels. 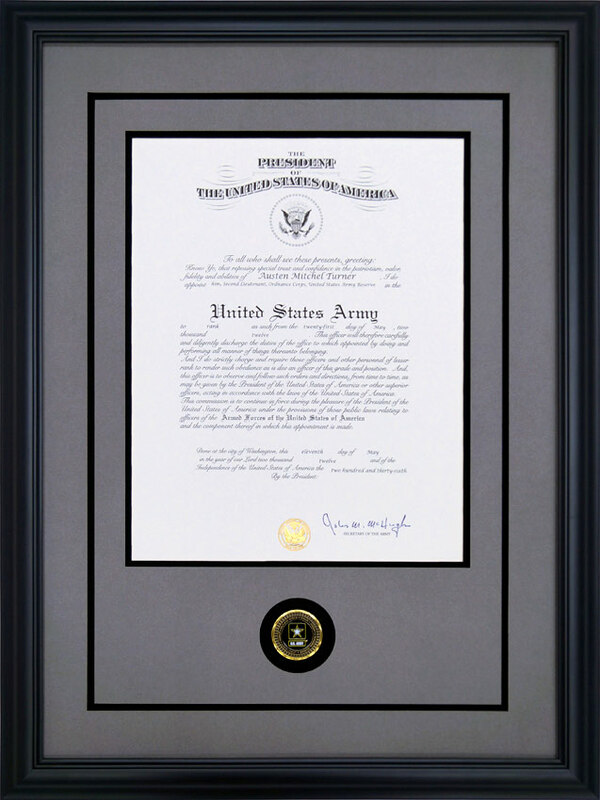 Framing military diplomas, military certificates, and military awards involve the ability to add additional items to the frame. In addition to the challenge coins, we often add insignias, patches, rank pins, uniform crests, ribbons, medals, and photographs. We offer the flexibility to frame the items that truly reflect a memorable accomplishment. A good example of this is the Ohio State University diploma frame on the right. It incorporates a custom design using a number of school mementos with the diploma. 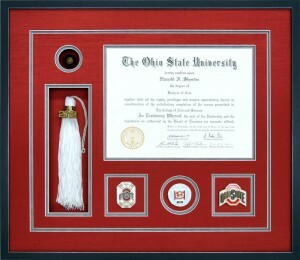 This example of a custom college diploma frame includes an Ohio buckeye, the graduation cap’s tassel, Ohio State insignias, and an Ohio State coin. 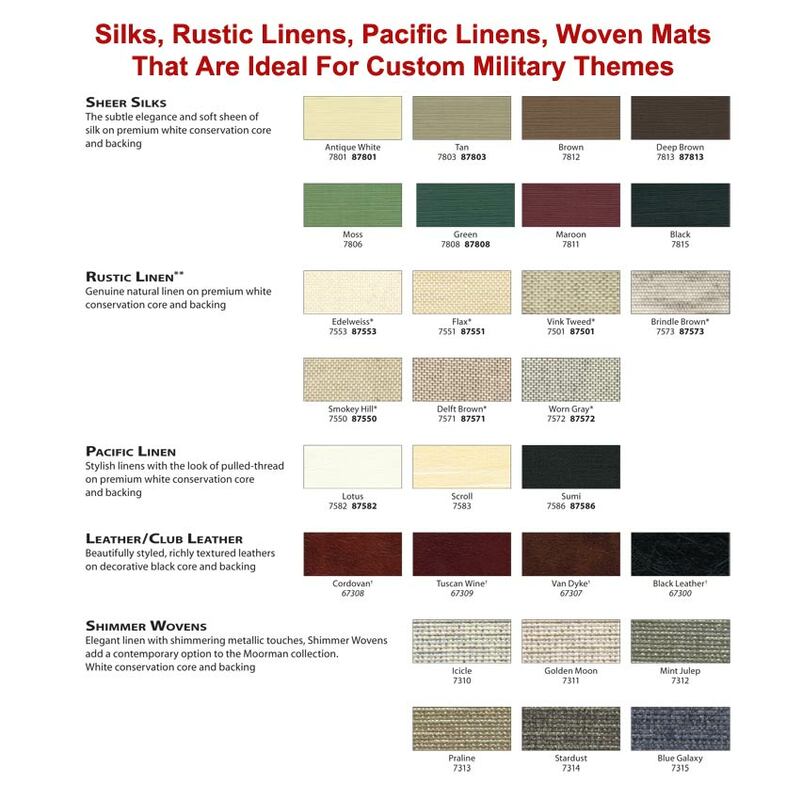 This design uses triple acid-free/conservation grade mats. Red silken top and bottom mats match the colors of the items in the frame below the diploma. A suede gray mat is used for the middle mat depicting one of the school’s colors. A black wood frame with silver edging complements the custom design. Custom college diploma frames can incorporate a number of mementos to enhance the degree. We welcome the opportunity to custom frame your college diploma. Basically, we are not a cookie-cutter frame shop with one frame design for all diplomas. 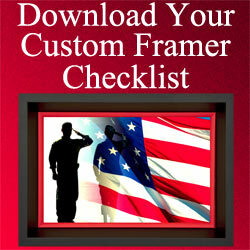 We are a full-service custom frame shop that practices conservation framing. We offer variations of shapes and styles of profiles for framing diplomas, awards, certificates, and documents of recognition. Please contact us with any requests for information. We will gladly create a design to frame your certificates, diplomas, or awards. Since we are custom picture framers, we can also design the frames to accommodate a number of objects with a diploma, certificate, or award. All of our framing is conservation grade. Please note, we use archival hinge mounting tape to secure sheepskin diplomas in place. For all other diplomas, they are mounted using reversible acid-free foamboard. Conservation grade framing is at the heart of our quality control process. Because we believe so strongly in conservation framing, we have written a complete section on quality and how to select a custom framer. If we can be of service, or make suggestions for framing your diplomas, certificates, or awards, please contact us.